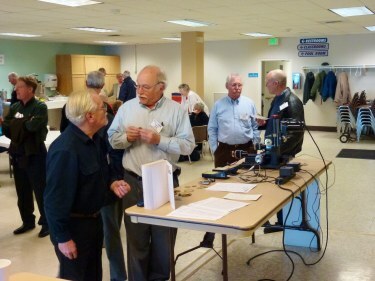 We welcome visiting members of NAWCC or anyone with an interest in Horology to join us at our meetings. 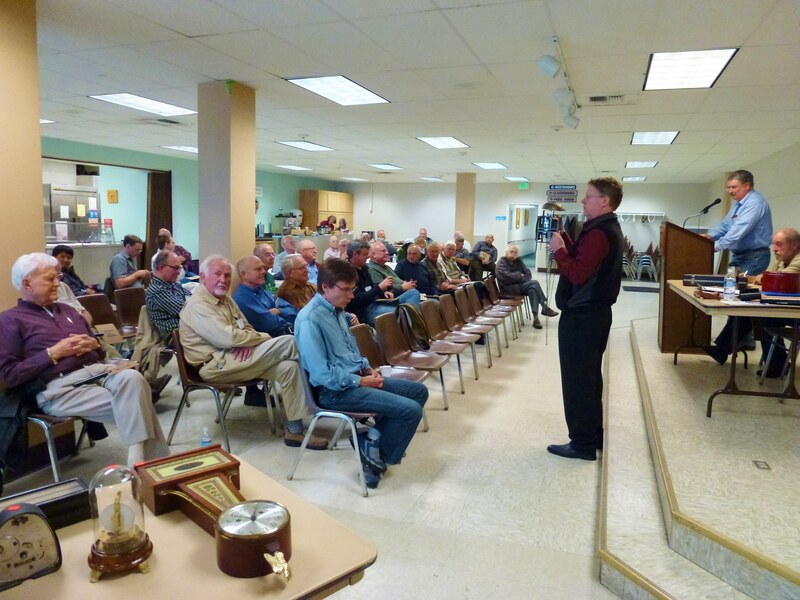 The regular meetings for Chapter 50 are held monthly, at the Cedar Valley Grange Hall, 20526 52nd Ave West, Lynnwood, WA 98036 . 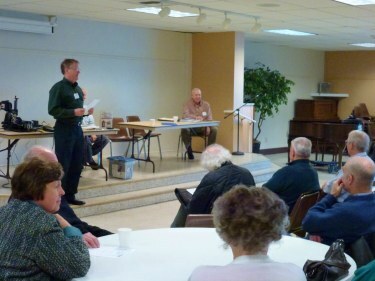 The meetings are normally on the 2nd Sunday of the Month. On occasion, other activities will replace the regular meeting, so it is important to check the Meeting Schedule on the Home Page. 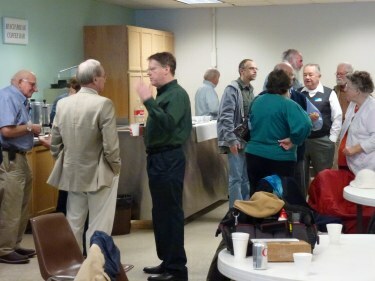 At our meetings, a Hospitality time with coffee and snacks starts at 12:30PM. Also during this time a Mart is held, where Horological material may be bought & sold. At 1:30 PM we have a short business meeting. At about 2:00 PM we enjoy a program on a wide range of Horological topics. 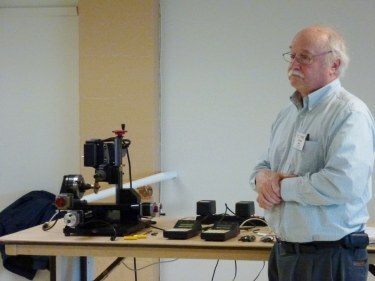 We were fortunate to have Paul Middents give us a preview of the research that he and his group are do-ing on the Street Clocks of Joseph Mayer of Seattle. They are working to gather the history of the Mayer family and their in-volvement in the jewelry and watch/clock material supply in the Seattle area, as well as tracking the history and location information on the street clocks that Joseph Mayer sold (from E. Howard) and later built and supplied from his own company. The Mayer family was very much involved in the smelting and refining of the gold from the Alaskan Gold Rush. Two of the Mayer brothers went to Dawson City, Alaska in 1898—1901 as gold buyers. 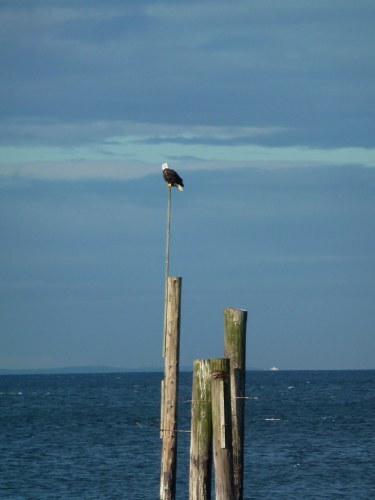 They had established their operation in Seattle before the US Government had an assay office here, and handled a large percentage of the gold that was found in Alaska. 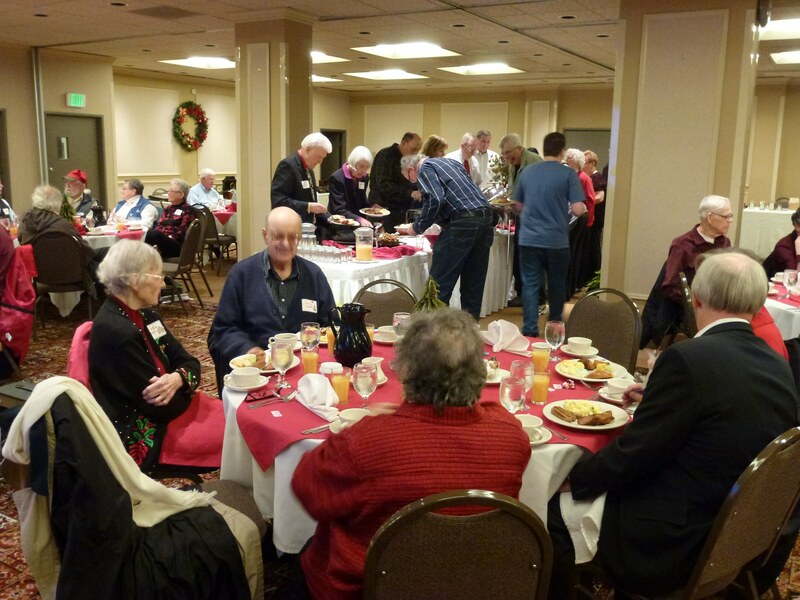 On Sunday, December 4th, about 60 members and friends of NAWCC Chapters 135 & 50, gathered at the La Quinta Inn in Tacoma for a joint Christmas Party and Brunch. 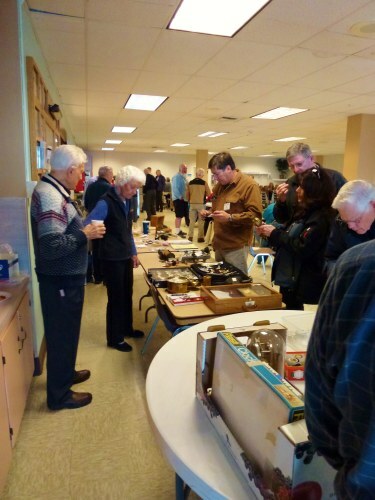 An active Mart period was followed by a very tasty buffet Brunch of ham, bacon strips, sausage links, scrambled eggs with grated cheddar cheese, cheese blintzes with strawberry glaze, country style biscuits, country gravy, fresh fruit, Danish pastries, muffins, bagels and cream cheese. 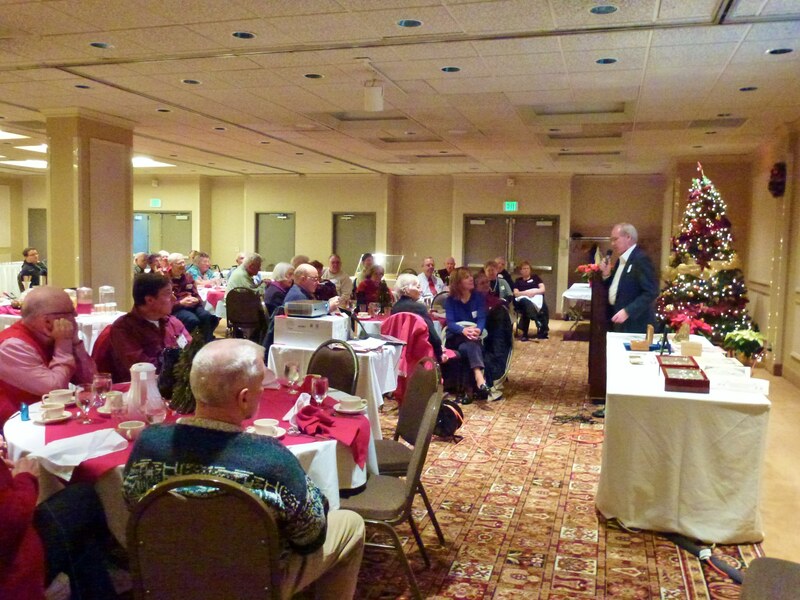 After drawings for a number of door prizes, the Ladies of Chapter 135 presented a "lively" discussion of their (or their husband's) involvement in the horology field. Ellen Wirth MC'd the program and kept things moving right along. 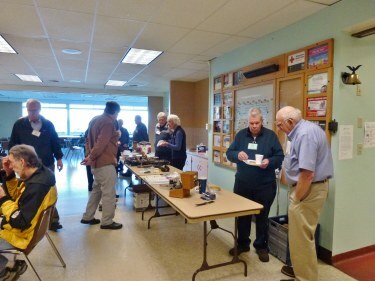 After the very enjoyable presentations, a few more drawings were made for the remaining door prizes, and we were adjourned to make one last pass through the Mart tables. A very enjoyable meeting! Thanks to Chapter 135 for hosting!!! 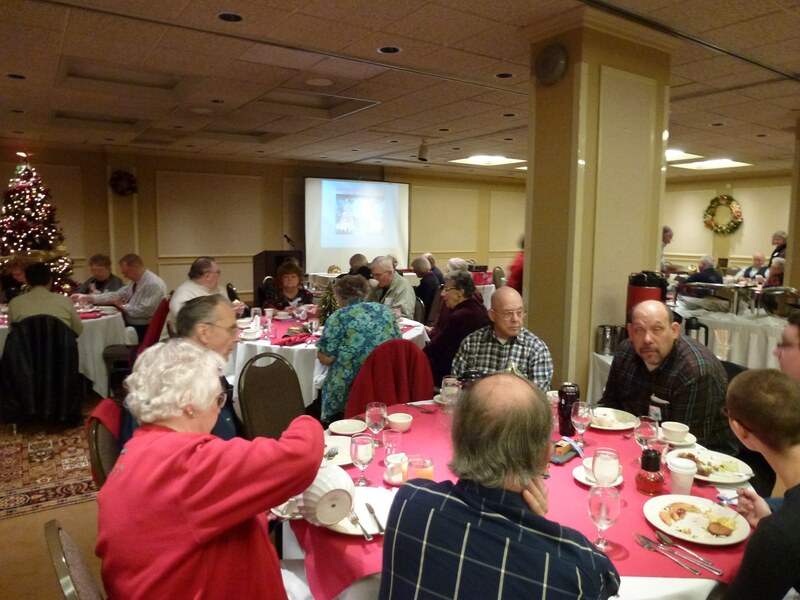 There were a number of door prizes which were distributed to lucky ticket holders. They included carry bags, caps, books and "mystery" packages. The 50:50 raffle drawing was also held, and the lucky winner received $88.50 in cash! 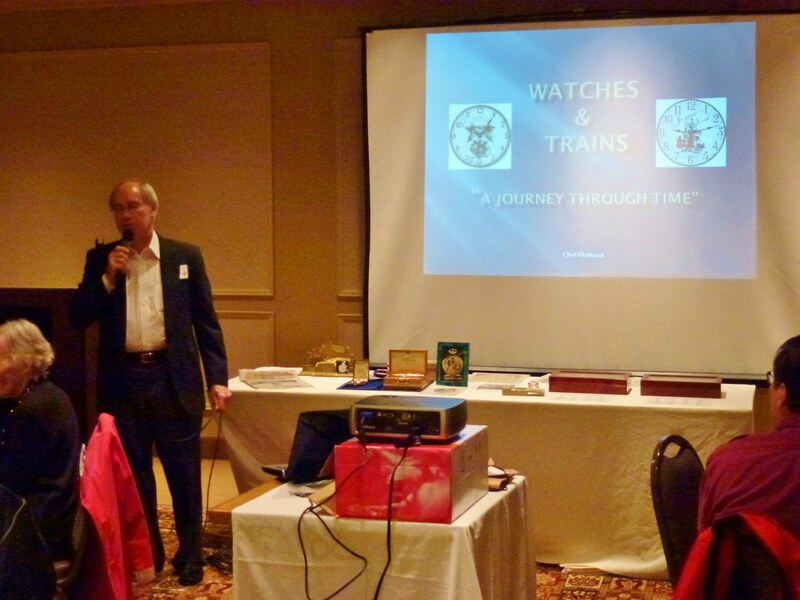 Railroad Grade watches from his personal collection. A truly significant collection of these wonderful watches! We were also fortunate to have a display of very rare Gruen watches brought by Jack Goldberg. Fun was had by all. If you didn't make it this year, make sure you plan ahead for next year!! 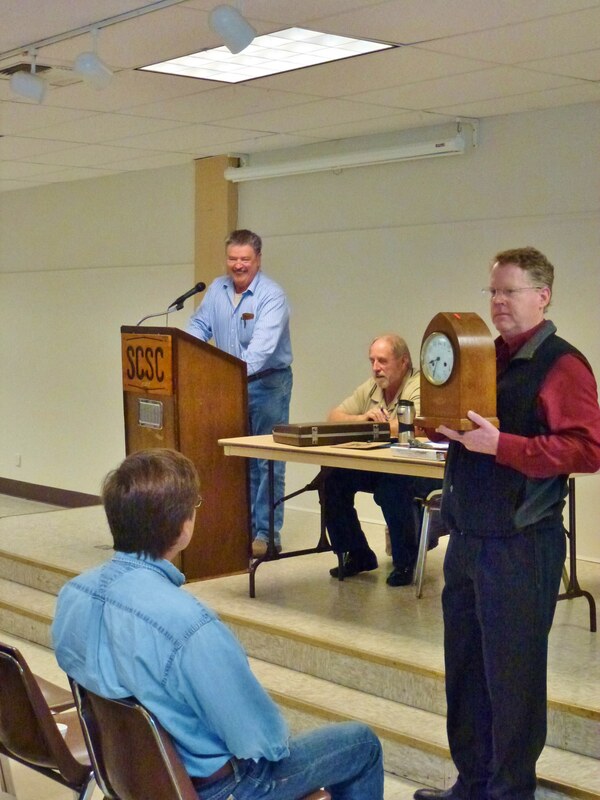 The October 14th meeting of Chapter 50 was the 2nd Annual Auction, organized by Ron Kowalski. We were fortunate to have John Connolly and Jim Marinello from BC Chapter 121 down to help with the auction. 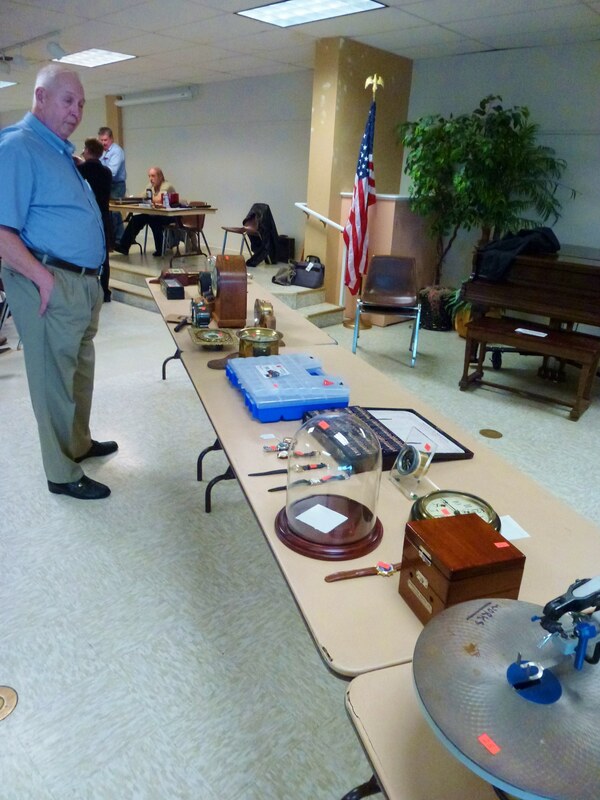 There was a wide variety of items offered for sale, ranging from watches & clocks to tools and parts. 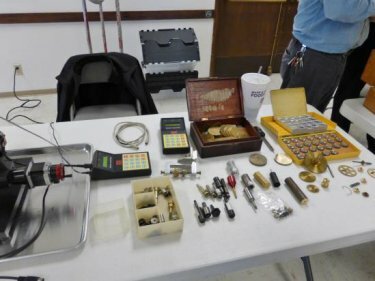 A total of 54 items went to bid. 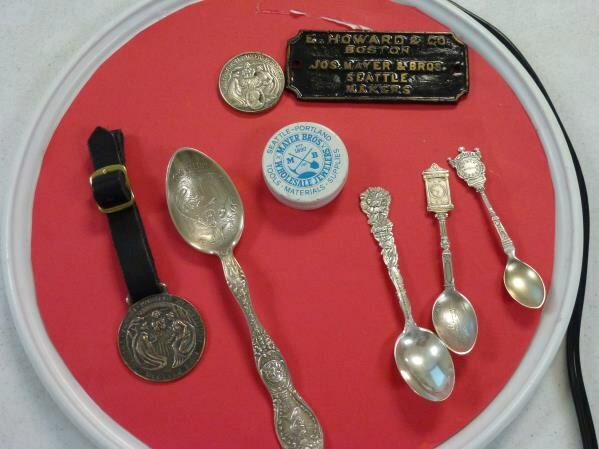 Of these, 38 went to new homes, while 16 items were repurchased by the seller. 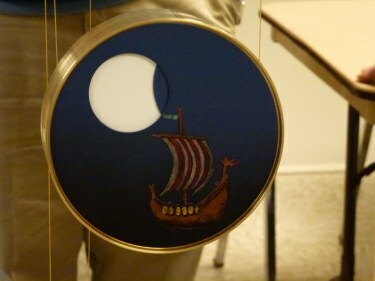 Phil talked about his concept and development of the “New Concept for Moon Dial. This was a sort of follow-up to the Long Duration clock that he has previously shown. 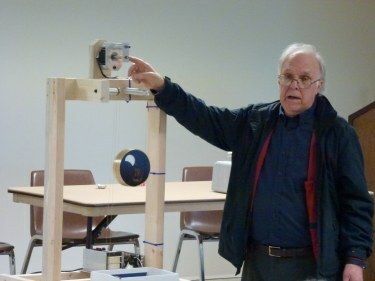 Phil brought a demonstration set-up with a stepper motor so he could run the Moon Dial through its phases in a rapid manner. 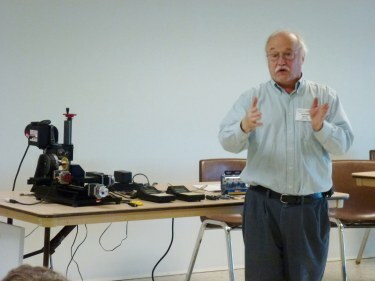 We then enjoyed a program by Clint Harris on his project to design and make a supply of “universal” click wheel gears for a kitchen clock. 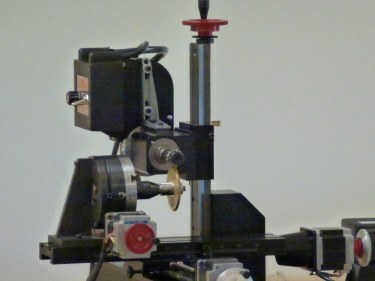 He said that it had taken him 20 years of collecting tools to accumulate the proper tools to cut gears. 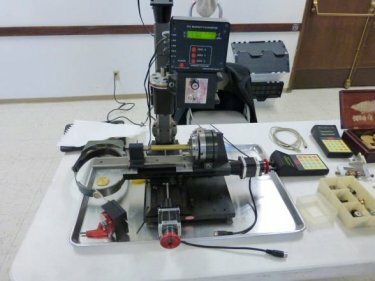 Clint also brought in and displayed the Sherline CNC mill that he had used to cut these click wheel gears. 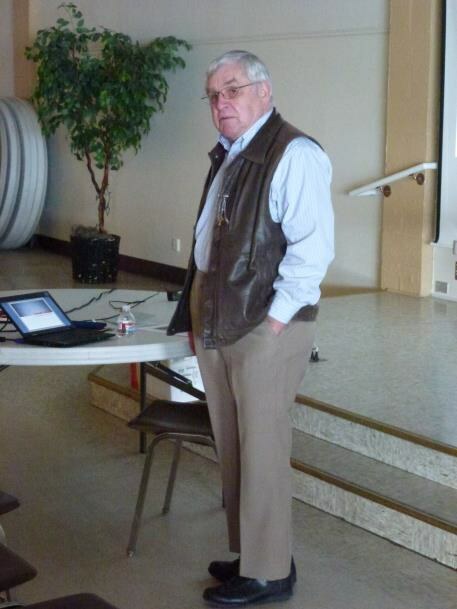 He described how he designed and made a supply of click wheel gears that could be made into either left or right hand gears.